Amazon in Europe is a unique market - while there are 5 separate marketplaces (UK, Germany, France, Spain and Italy), the countries are close enough to each other that they can be treated like a single marketplace. So we decided to analyze European marketplaces and see how much of cross border selling is there. To start, if a European seller decides to sell internationally, they at least sell in the UK. Across all marketplaces most sellers are also selling in the UK. In Spain for example, 66% of sellers also sell in the UK. UK is the largest European marketplace with 60,893 active sellers (active sellers are defined as sellers we estimate to have sold at least one product in a month). A third of UK sellers though also sell on other marketplaces, mostly in Germany. There are 6,600 active sellers selling on all European marketplaces. For UK that means that 10% of UK sellers sell on all marketplaces. This is a higher percent that we thought it would be - keep in mind this is not sellers who also list their products in other marketplaces, these are sellers who had sales in all marketplaces. France, Italy and Spain are the smaller European marketplaces and for each of them more than a half of sellers sell internationally too. For example in Spain 66% percent of sellers also sell in the UK. Amazon has built infrastructure to allow this. Like the European Fulfilment Network (EFN) which allows sending inventory to UK warehouses and offer it to all marketplaces. And recently Pan-European FBA, which handles products distribution in Europe instead of having to send products to all countries yourself. 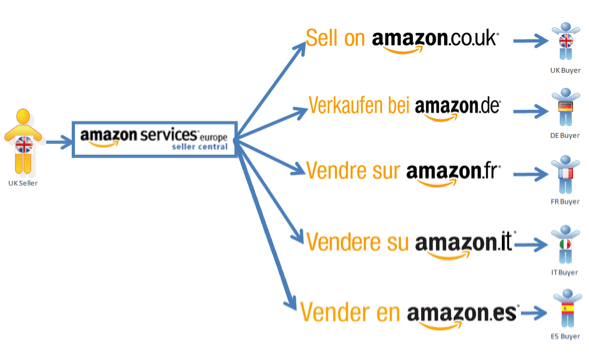 Amazon is continuing to add services which hide the complexity of selling in Europe as if it was a single marketplace. For most sellers it’s as easy as checking a few checkboxes in SellerCentral and their products start to appear in all marketplaces. It’s important to note that sellers launching their own products are going to have to do their own translation and optimization for each country. For example keywords are completely different. So while Amazon has made it easy to handle fulfillment in Europe, the task of internalization is still up to the seller. For US based sellers this means that when launching in Europe they should first prioritize UK (no need for translation, biggest market), but then expand in other marketplaces too. Amazon is trying to make it so enabling all marketplaces would be risk free, and only have a potential upside. They are not there yet though, and sellers should be aware of all the fees attached to pan-European distribution.